Ginger Root Health Benefits! Get 8 Recipes! Have you tried fresh ginger root? I use it regularly, and to be honest, I don’t like the hot taste very much! Anticipating the question of why do I consume it, I will put it simply: because ginger root health benefits are so essential that it would be silly to miss such an opportunity! 1. 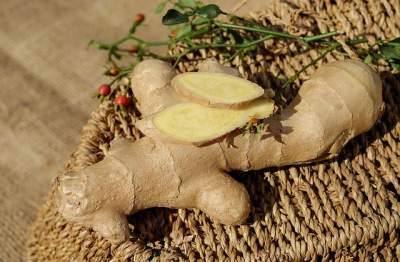 What is ginger root? 2. What are ginger root benefits for men and women? 3. 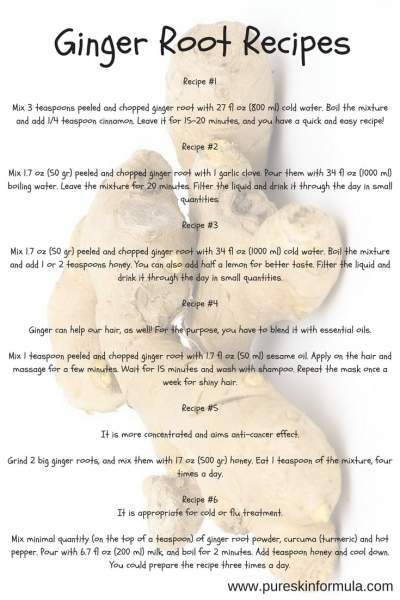 Recipes how to use ginger root for hair, body, and skin. We have a lot to cover, so let’s start. Ginger is a fascinating plant! Some people make ginger beer; others use it for fragrance in soaps and cosmetics. A third group uses it as a cure! Even if you have never used ginger, you most probably have seen it in the store – a strangely shaped herb that looks a bit ugly and is very hard to depict. But the real value is hidden “below the surface”:) Let’s see what is in there? At first sight, ginger root was nothing special. When I saw it for the first time, I wasn’t impressed by the nutrition table, unlike the effect that spirulina or angelica root components had on me. Don’t get me wrong. Ginger root is full of “gems,” like Calcium, Phosphorous, Potassium, Magnesium, diet fibers, vitamin B, and C. But still nothing exceptional. We have seen these components in many plants. Regarding the spicy effect, ginger owes it to a substance called zingerone. But don’t get scared! It is a thousand times weaker than those “killing” chilly peppers we know! Apparently, the reason why ginger root is so valuable is “hidden” in the unique “teamwork” of all compounds, which are combined in a way to deliver maximum positive effect to our body! And the result is astonishing, as you will read in the next lines! What are ginger health benefits? If you feel uncomfortable, while sailing, you could try it to relieve your symptoms! 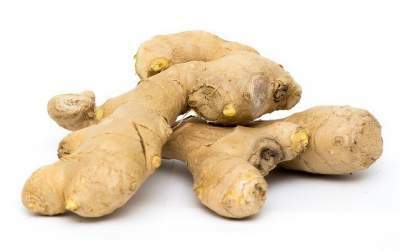 Experiments with mice have shown that ginger root has some anti-cancer properties, being natural anti-oxidant. This effect might be more significant, regarding ovarian cancer and cancer of intestines. Ginger is considered relieving chemotherapy disorders. It helps kidneys in their normal functioning. Ginger balances the blood pressure and keeps it within the norm. It prevents blood clots and narrowing the arteries. Ginger will relief you when you catch a cold, angina or flu. It stimulates saliva production, thus clearing the bronchial tubes. Ginger neutralizes stomach acid and facilitates digestion. Ginger has anti-inflammatory properties and fights a chronic problem and migraine attacks. If you have arthritis, ginger could help you with inflammation process. You could both drink ginger juice and apply on the affected area. For the latter, mix ginger powder or chopped fresh ginger root with hot water, until you get a thick mixture. Apply it on the problem zone and leave it for an hour. This is maybe the most famous property of ginger. A lot of people associate ginger with burning fat and stimulating metabolism. OK, it is time to go to turn the next chapter today! By that time I am sure I have raised your curiosity towards ginger, and now you are eager to understand how to utilize these numerous benefits! Let’s start with three methods that will help you lose weight. Mix 3 teaspoons peeled and chopped ginger root with 27 fl oz (800 ml) cold water. Boil the mixture and add 1/4 teaspoon cinnamon. Leave it for 15-20 minutes, and you have a quick and easy recipe! Mix 1.7 oz (50 gr) peeled and chopped ginger root with one garlic clove. Pour them with 34 fl oz (1000 ml) boiling water. Leave the mixture for 20 minutes. Filter the liquid and drink it through the day in small quantities. Mix 1.7 oz (50 gr) peeled and chopped ginger root with 34 fl oz (1000 ml) cold water. Boil the mixture and add 1 or 2 teaspoons honey. You can also add half a lemon for better taste. Filter the liquid and drink it through the day in small quantities. Ginger can help our hair, as well! For the purpose, you have to blend it with essential oils. Mix 1 teaspoon peeled and chopped ginger root with 1.7 fl oz (50 ml) sesame oil. Apply on the hair and massage for a few minutes. Wait for 15 minutes and wash with shampoo. Repeat the mask once a week for shiny hair. Grind 2 big ginger roots, and mix them with 17 oz (500 gr) honey. Eat 1 teaspoon of the mixture, 4 times a day. It is appropriate for cold or flu treatment. Mix minimal quantity (on the top of a teaspoon) of ginger root powder, curcuma (turmeric) and hot pepper. Pour with 6.7 fl oz (200 ml) milk, and boil for 2 minutes. Add 1 teaspoon honey and cool down. You could prepare the recipe 3 times a day. Use it in case of stomach disorders. Mix 1 teaspoon ginger powder with 1 teaspoоn nutmeg. Pour with 3.4 fl oz (100 ml) water and drink the mixture. Apply it if you have issues with kidneys. Mix 1 teaspoon ginger powder with 1 tablespoоn fresh onion juice. Consume 1/2 teaspoon of this mixture 4 times a day. Ginger is LIKELY SAFE when taken by mouth appropriately. Some people can have mild side effects including heartburn, diarrhea, and general stomach discomfort. Some women have reported increased menstrual bleeding while taking ginger. Ginger is POSSIBLY SAFE when it is applied to the skin appropriately, short-term. It might irritate the skin for some people. I hope you will agree with me that it is pointless to avoid ginger root, as it has significant properties and many benefits, with no severe downsides! Get ginger root from the store and start experimenting with some recipes, shared here. Don’t wait to feel some discomfort, to use ginger. It can be a fantastic solution to keep you fit and prevent you from potential health issues! I would love to hear from you! Do you (plan to) use ginger and what would be your approach? Leave me a comment, and I will answer you! I am a huge proponent of ginger. It is something I incorporate into my daily regimen. I consider it a super root! I struggle with severe food allergies and drink a concoction of Lemon Zinger tea and shredded ginger every morning to coat my tummy. I have also experimented with creating a natural soda using a starter called a “ginger bug” which creates the fizziness to any liquid that it is added to. I wrote down recipe #6 – cold/flu treatment – for the next time I get sick. Thank you for adding some recipes to my existing repertoire! Thank you very much for your comment! You and I are very much alike regarding drinking ginger very often! What you say about natural soda is very interesting! I haven’t heard of this ginger property and I will try it. Thank you very much for mentioning it! 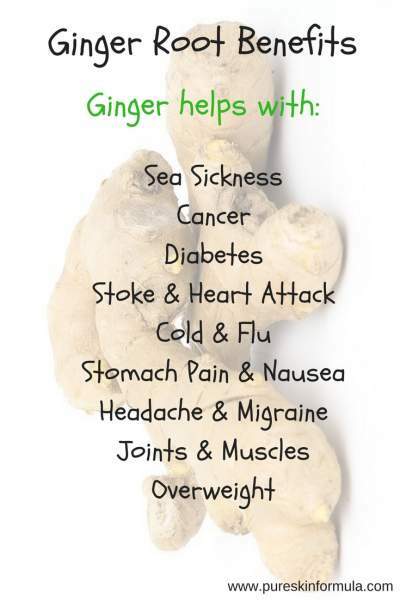 Very interesting to read about all the potential health benefits associated with Ginger. I am always very keen to learn more about healthy foods. I think it is great you have provided recipes of how to use Ginger root, as it is one thing to understand more about it but applying it into everyday use is another thing completely…and you have covered all of these bases. Regarding recipes, agree with you that ideally a text should not only inform, but give solutions, as well! At least this is what I try to, whenever this possible! I am sorry to hear about your hair issue! And I am glad that you want to take action and try the recipe! The only way to see if something works is to test it! Wish you good luck and hope you will be fine! I love ginger and what a great post! I especially love the fact that it helps with weight loss and is great to prevent flus and sickness. When I fly, I often take ginger to prevent nausea. I also boil water, and add raw ginger root and let it steep for awhile which makes for a great, healthy tea! I’ve bookmarked your article to reference for the great recipes! This is such an interesting article about the wonderful benefits of ginger. Adding ginger to as many dishes as I can has been a great help to me as I have a few food allergies. Will try to have it earlier in the day and rather steeping it and drinking it down. This might help more. Yes, you can drink ginger all day long. Just prepare enough quantity in the morning, put it in a bottle and take it with you outside, at work, in the park, or wherever you are!